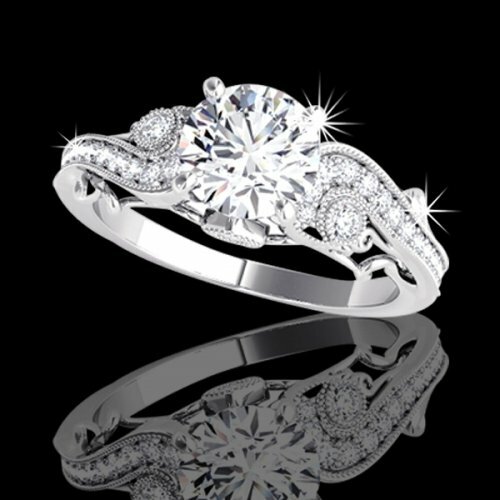 This sophisticated diamond engagement ring will delight you with its intricate detailing and elegant design. A beautiful, natural enhanced, .75 carat, brilliant round cut diamond is the central focal point of this design. This diamond takes your breath away with its very good cut, polish and symmetry. This sparkling diamond is SI2 clarity with a G color grade. The setting features a gorgeous hand sculptured design with a unique scroll. 30 glittering round cut diamonds are meticulous set on the sides for an eye-catching effect. These side diamonds have a total combined weight of .20 carat, SI1 clarity, G color, set in 14kt white gold.